Save time and effort to release your iOS and Android app faster. 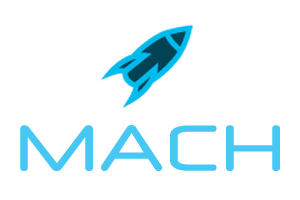 MACH is designed to make your life as a mobile app developer easier by providing you a reliable cloud-based platform that is pre-integrated to Apple's Push Network and Google's Cloud Messaging service. 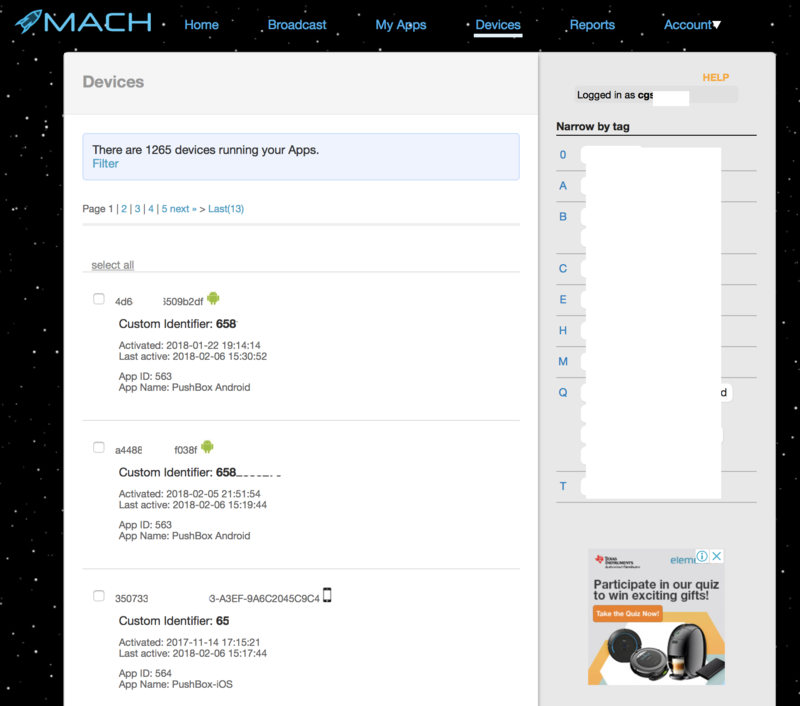 Call the MACH registration API each time your mobile app starts up. 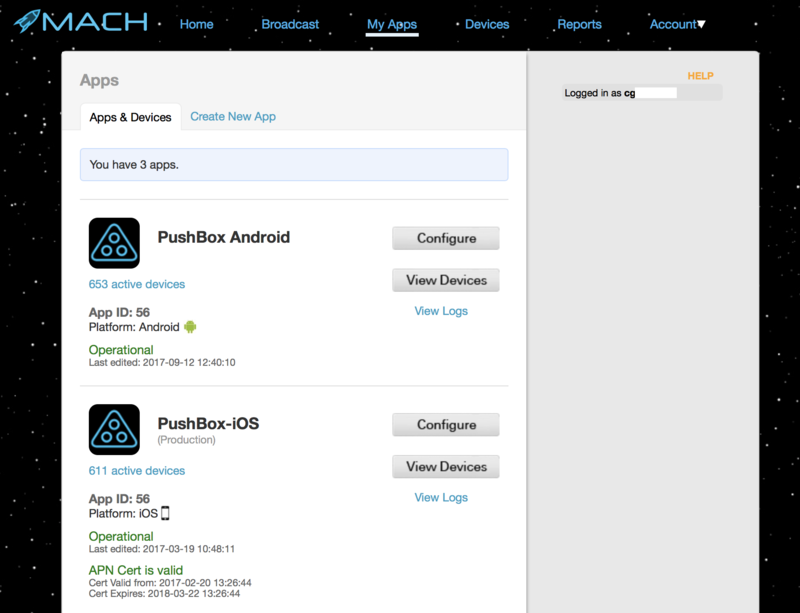 This lets the MACH service register each of your installed app with Apple or Google's Push Network and get ready to initiate Push Notifications. 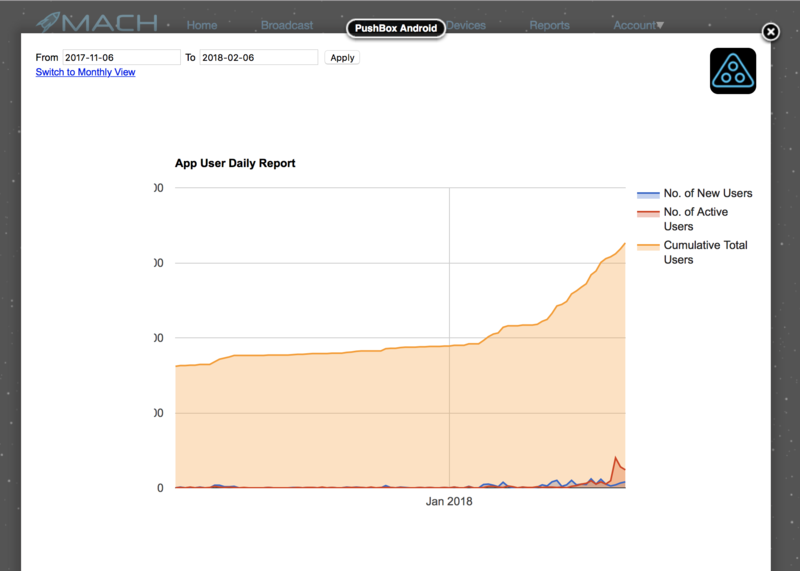 The MACH portal will also start displaying basic analytic data for tracking your app's User base. Start sending Push Notifications to your user base. You can do this easily using the MACH web portal's Broadcast feature, or you can automate Push Notification sending using the MACH API. Easily create a profile for your mobile app for iOS and Android. Use the credentials generated here in your API requests to the MACH service. Know in real-time how many devices have installed your app. You can create tags to segment your installed base. The MACH portal provides you a handy tool to send a Push broadcast to engage with your users.. Tags allows you to narrow down to only the specific segment you wish to reach. You get a graphical report on how many devices have installed and are actively using you mobile app..
Why is Push Notification important for my mobile app? We run MACH on Amazon's Elastic Compute Cloud across a few geographical regions. Running on Amazon enables us to provide our end-users with almost unlimited processing capacity available at a moment's notice. For customers who have specific compliance requirements, in addition to our dedicated server hardware farm in our Singapore datacenter. Can't I integrate to Apple and Google on my own? Yes you can. However, you will have to learn Apple and Google's technical protocols separately from scratch, and also implement a few other non-trivial items such as hosting a Push Notification server, processing feedback loop info on invalid push tokens, keeping message logs and so on. You can find these all these feature already built into MACH, plus the HTTP API is extremely easy, they are basically HTTP requests sent with parameter and value pairs. MACH is also extensively tested and monitored to ensure you have a reliable platform to count on. Tell me more about the Free Plan. MACH's Free Plan is 100% free to use and contains almost all the features found in our Premium Plan. However, your message sending throughput is throttled and you may see some ads from our sponsors when you login to the MACH Web Portal. See here for more details! Send us an email, we'll get back to you asap!